The VFA's time on the national stage came to a tumultuous end in 1970 after a prolonged battle with the ANFC and the VFL over transfer agreements and other issues. A 1975 match against the OMFL was the VFA's first representative match since 1968 and the Association returned to their traditional, pre-ANFC colours of royal blue and gold, worn for the first time with a Fitzroy-style yoke across the top of the jumper. Sponsor patches on football jumpers had become a national trend following their introduction by the VFL in 1977. This was the first VFA representative jumper to feature a sponsor patch, and the VFA took things a step further with the addition of a sponsor on the back of the jumper. The yoke was also moved higher on the front and back of the jumper to increase the visibility of the sponsor patch, VFA shield and player numbers. The move to a lighter blue coincided with the launch of a new VFA emblem - the iconic shield that remained the official VFA logo until 1995 when the Association was re-branded as the Victorian Football League. This emblem was announced with much fanfare in the 1979 VFA matchday programme as "the new logo which will be seen throughout the Recorder and during matches on a Sunday"... yet it did not appear on VFA club jumpers until 1982(!). 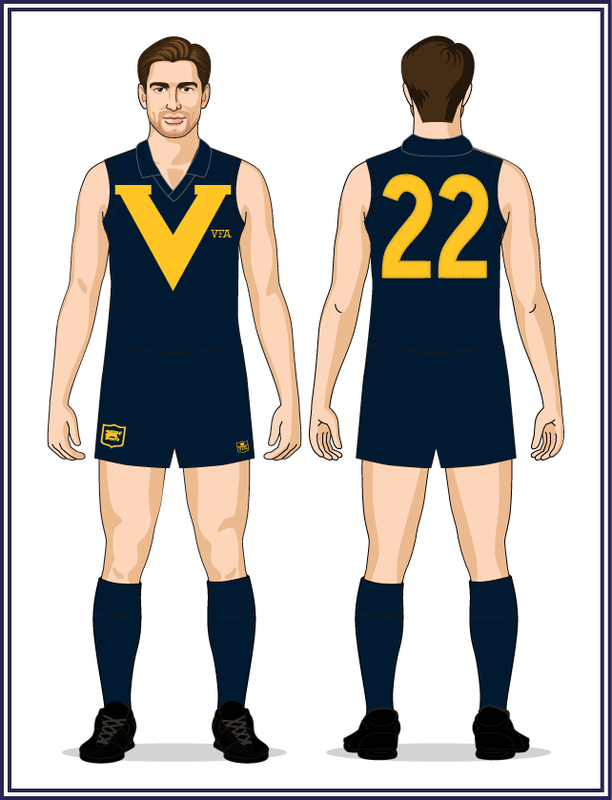 The 1979 uniform was also the first to feature the famous Big V which until that point had only appeared on the rival VFL's navy blue and white state jumpers. The V used here is the classic version which first appeared on Victorian jumpers at the 1950 National Carnival. The AWA sponsor patch was replaced by a Pura Milk logo. Tooth KB Lager replaced Pura Milk as the jumper sponsor. The same Tooth patch appeared on North Melbourne's jumpers during the 1980 VFL season. Sponsor patch removed and numbers changed to gold, otherwise the jumper remained the same as the previous version. A return to the VFA's traditional royal blue. This design also featured a new "skinny" V which was unlike any that had ever appeared on the VFL-AFL's state jumpers. From 1984 to 1986 the VFA premiership competition became known as the Mitsubishi Motors VFA Cup and as part of their naming rights sponsorship, the Mitsubishi patch appeared on the front of the VFA representative jumper during these years. In 1987 the ANFC (now renamed the NFL) came calling when New South Wales dropped out of the annual Section 2 championships, known as the NFL Shield. The VFA accepted the invitation and over the next three seasons played matches against all states and territories other than Victoria (VFL) and South Australia. This return to interstate status was capped-off by the VFA claiming the 1987 NFL Shield (the Association's first national championships title since 1961). ANA took over as VFA naming sponsor in 1987 but their logo did not appear on the representative jumper. Apparel sponsor Buffalo Sports had their logo added to the shorts. The VFA trialled a new uniform in these pre-season practice matches played at Skinner Reserve in Sunshine. 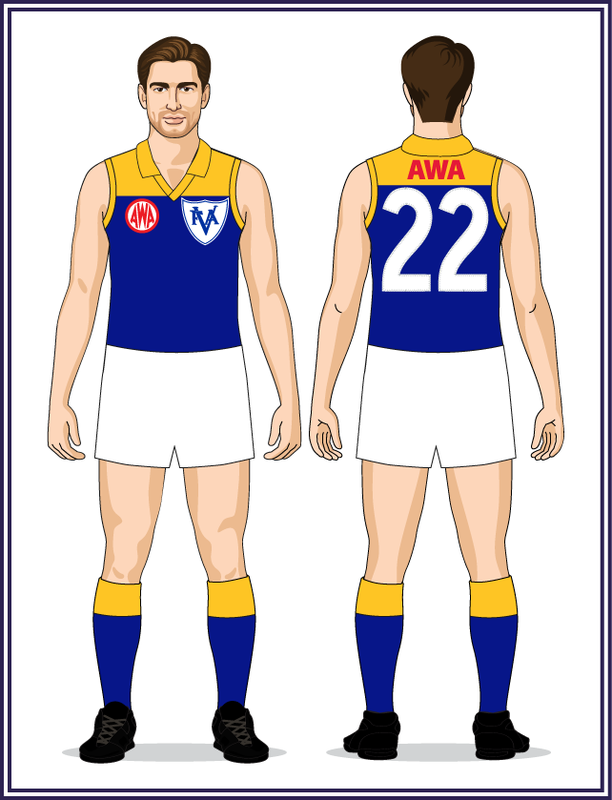 Although no evidence of a link has been found, it would not surprise if the West Coast Eagles' inaugural gold uniforms with royal blue facings worn in 1987 were the inspiration for this design. All of the VFA player photos in the 1988 Carnival programme feature this yellow uniform with royal blue V but by the time of the Carnival's opening match, this footballing version of the "Yellow Peril" was nothing more than a faint memory. In the days leading up to their first match at the 1988 National Carnival the Association summoned football media to VFA House to present representative coach Terry Wheeler (Williamstown), captain Barry Round (Williamstown) and vice-captain Allan Eade (Coburg) wearing new navy blue and gold uniforms. It marked a turning point for the Association. Their arch rivals the VFL - along with other Victorian sporting teams from baseball, lacrosse and rowing - had first adopted navy blue as the state sporting colours in 1903-04. The VFA had experimented with navy blue in 1906 and 1950-1968 but had always returned to royal blue. At the time it was merely a colour change, but history tells us now that it marked the start of a transition that would lead to the VFA being taken over by Football Victoria in 1995, re-branded as the VFL in 1996 and, from 2001 onwards, sporting the navy blue and white representative jumper of their old foe. 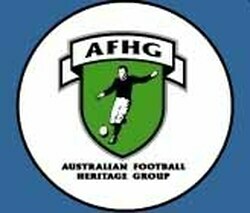 The VFA premiership had been officially known as the ANA Cup since 1987; and in mid-1988 the ANA logo was finally added to the VFA's representative jumpers for these matches in Hobart and Perth. 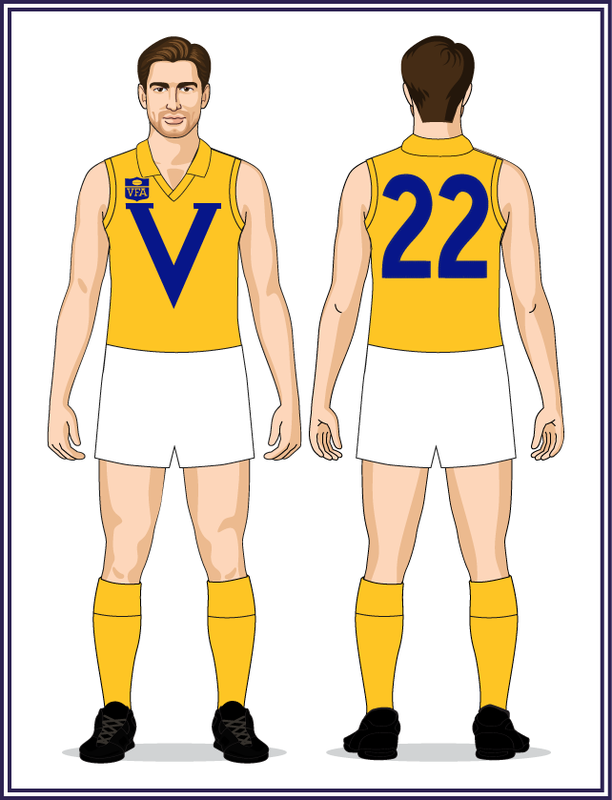 The VFA changed from their unique "skinny" V to the chunky V first worn by the VFL between 1961 and 1975. On a side note - the official VFA logo had remained royal blue with gold text in 1988 despite the change of colours by the representative team, but in 1989 the VFA logo was also changed to navy blue and gold on club jumper patches and in the VFA's Football Recorder matchday programme. Mayne Nickless replaced ANA as the VFA's naming rights sponsor in 1990 but their logo did not appear on the representative jumper. The Association's name moved from right to left on the jumper (with "VFA" in text format being replaced by the full VFA emblem), and a sponsor patch (Quit) was added to front right of the jumper. The other change was the addition of two gold bands to the socks. The VFA's final season saw the competition re-named the VICsafe Cup and the competition's new sponsor also appeared on the front of the representative jumper.